Eon Altar has battled its way onto Steam Early Access. Described as the ultimate couch co-op RPG, the game makes use of smartphones as controllers, letting anyone in the room pull the phone out of their pocket, download the free Android or iOS controller app, and jump into the fray. 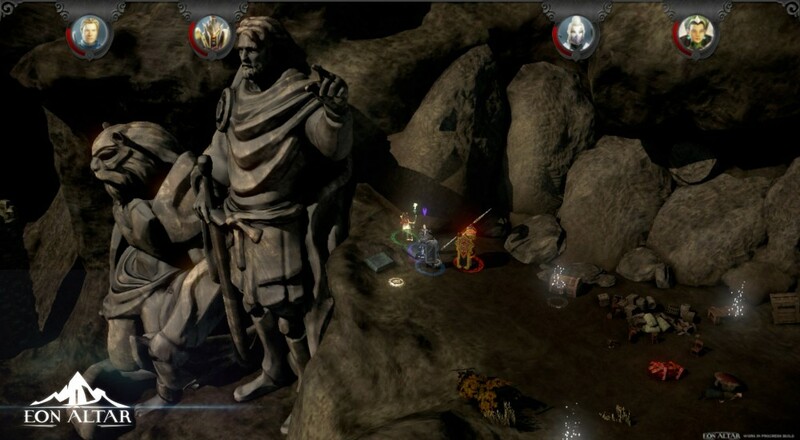 Even though it's a PC game, Eon Altar requires smartphones to play, even for single player. The official phrase is "a mobile-enhanced cooperative RPG", which sounds like a gimmick until you think about the possibilities. For example, mobile devices can be used for custom button inputs that change depending on the situation. (What's that line from Conker's Bad Fur Day? Context sensitive.) Not only that, but with those bright beautiful screens in players' hands, information other than button layouts can be displayed, providing hints or even secrets to certain players and counting on them to share (or not) with their teammates. It brings a whole new level of cooperation to role playing, and the dev team is excited to explore the possibilities. Ok, so how about the actual game? Eon Altar is an isometric RPG stuffed to the brim with enemies, weapons and gear. Combat is tactical turn-based and uses the phone screens' adaptability to their advantage. If you were worried that a lack of physical buttons would ruin the game, don't. This ain't no hack and slash dungeon crawler. Eon Altar is 90% complete and available on Steam Early Access. Invite some friends over and get this tactical RPG party started! Page created in 0.9840 seconds.